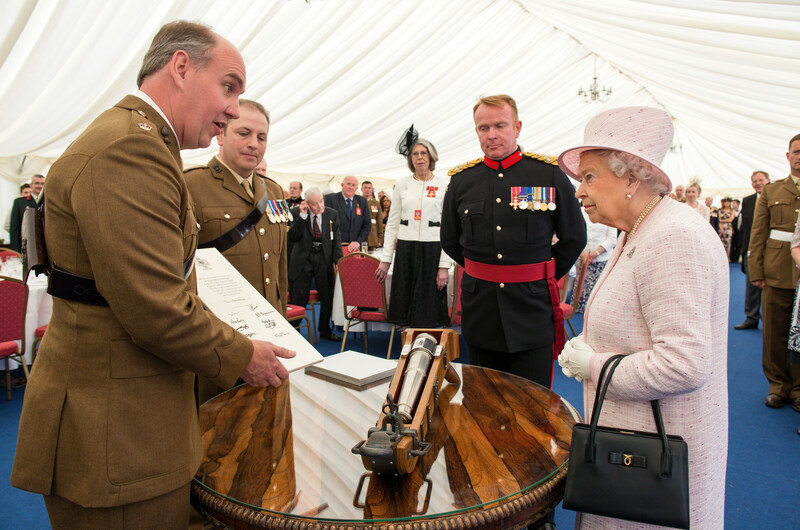 Celebrating the 300th Anniversary of their founding, Wiltshire based Royal Artillery welcomed Her Majesty The Queen, Captain-General of The Royal Artillery, to Knighton Down in Larkhill, Wiltshire to attend a Review of the Royal Regiment of Artillery on 26 May 2016. Raised by Royal Warrant in 1716, the Royal Regiment of Artillery marked a historic three centuries on 26 May 2016. Commonly known as the ‘Gunners’, the Royal Artillery provides firepower to the British Army. The Queen has been Captain-General of The Royal Regiment of Artillery since 6 February 1952. 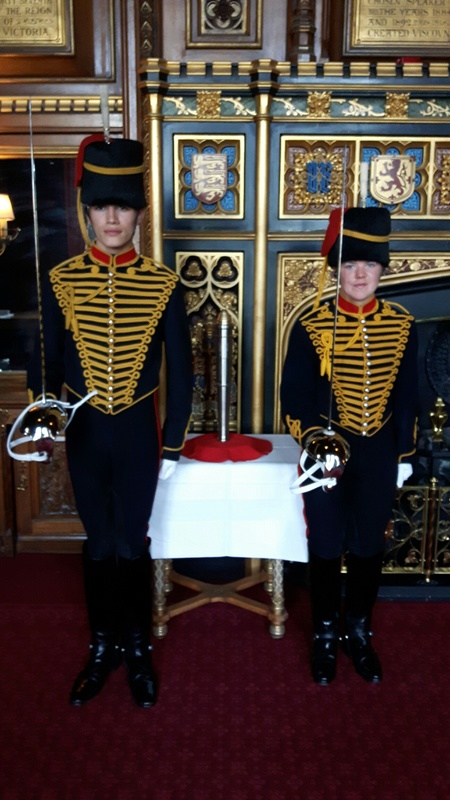 During her visit The Queen received the Royal Salute and inspected the Armoured Parade, before being presented with the Captain-General’s Baton by the youngest member of the Royal Artillery, 17 year old Gunner Mischa Kalis. The Captain General’s Baton was launched on a circumnavigation of the globe on 1 May 2015 from the Royal Arsenal in Woolwich. Known as the UBIQUE (meaning everywhere) 300 project, it has undertaken a relay of 60 expeditions through 30 countries, ranging from adventure training to battlefield studies to sports tours: over one thousand men and women from the Royal Artillery have taken part in its travels. 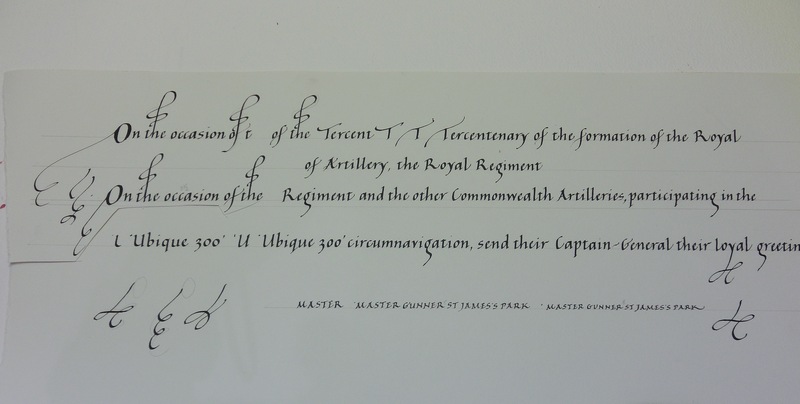 As a jobbing scribe, I rarely know what is going to be my next commission, but the one for the Royal Regiment of Artillery was one of the most interesting. 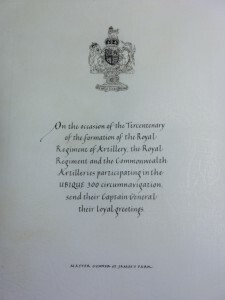 The years 2016 marked the Regiment’s tercentenary, and to celebrate this a group of their soldiers circumnavigated the globe. 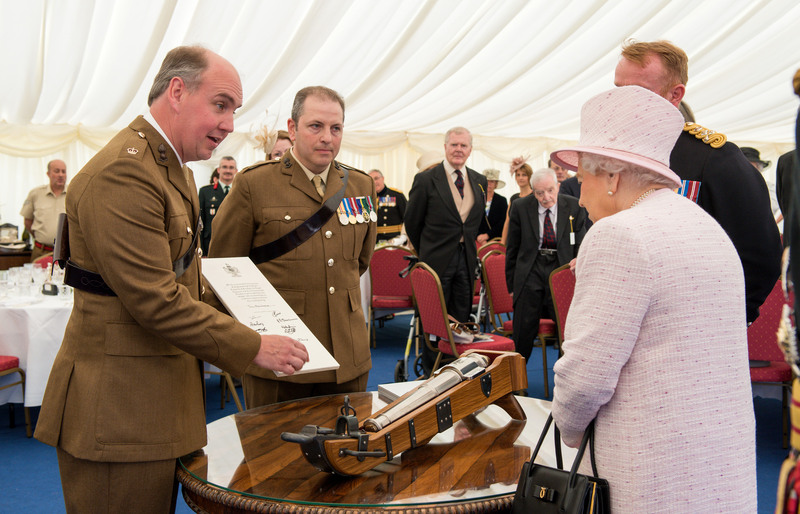 They took with them a specially commissioned titanium baton, inside of which was the vellum scroll being presented to The Queen on the right. While the wording was being finalised, I experimented with the initial suggestions, knowing that the text would have to be quite small as the scroll needed to fit inside the baton. A tercentenary is a major achievement so I thought that a few flourishes here and there would add to the celebratory feel. 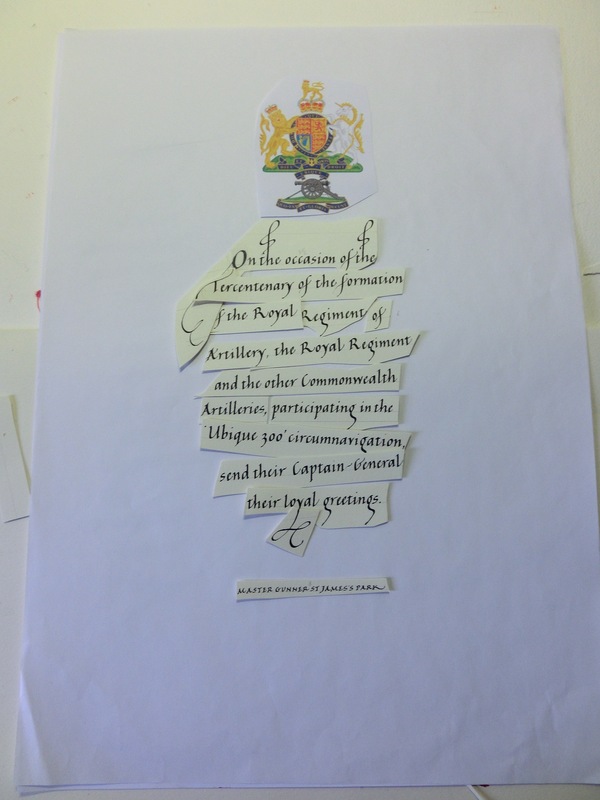 I was also looking forward to painting the Royal Arms and the badge of the Royal Regiment of Artillery. I made a few paste-ups to try to get the balance the best I could. I then heard that the requirement was for no flourishes and a black and white image so adjusted things accordingly. 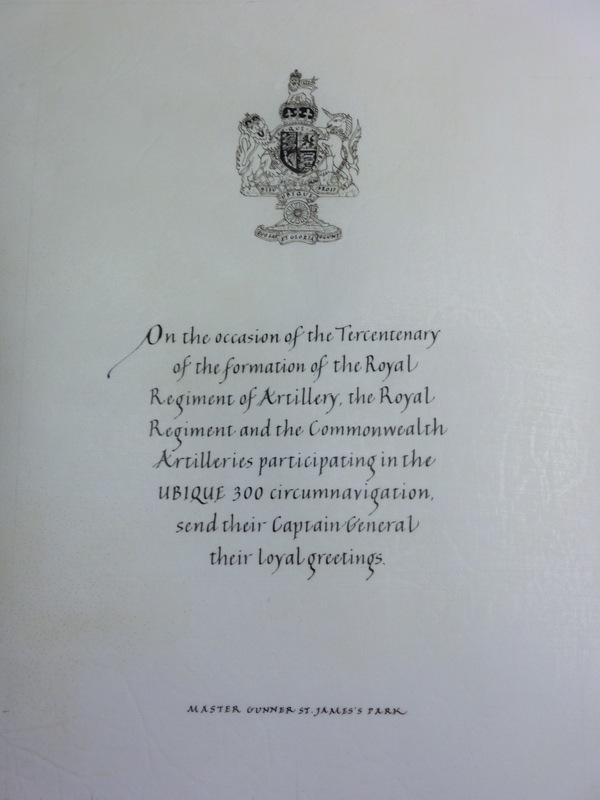 The space below the citation on the right was for the signatures (see first picture above) which were written during the circumnavigation by Commonwealth Artilleries sending their greetings to The Queen, who is the Captain General of the Gunners. It was a challenge to draw the Royal Arms and the Regiment’s badge as small as it needed to be, and the wheel of the gun carriage was actually just over 5 mm in the end. Despite the vellum going round the world, it arrived back to me for stretching in remarkably good condition – all credit to the soldiers who were involved. This is another picture of The Queen inspecting the scroll, which has here been stretched over a piece of wood to keep the vellum flat. However, this wasn’t the end of the story for me. I had the thrill of being invited to lunch, the special parade and the presentation of the baton and the scroll to The Queen. 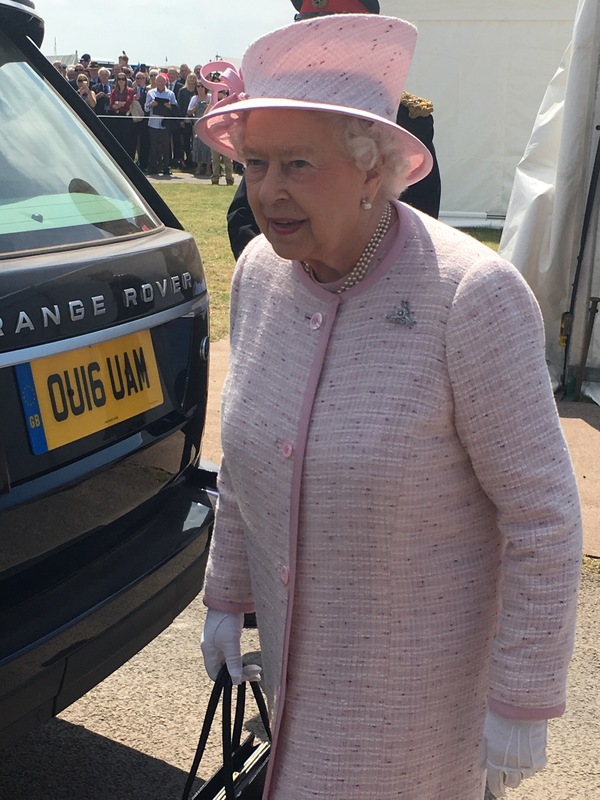 Being in the Royal Enclosure really was something special and we were this close to Her Majesty! It was a absolutely joyous day with families involved in watching marching bands, tug of war, gun carriage racing, a concert, and ending in fireworks. It was all such a treat and quite a change for me as I usually sit in my quiet workroom scratching away with a quill on vellum. 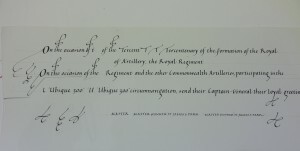 The signatures of the Commonwealth Artilleries are now in place and the vellum has been stretched. The Gunners with swords drawn standing guard over the baton. 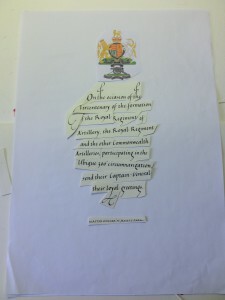 This entry was posted in Blog, Calligraphy and lettering, Interesting stuff and tagged Gunners, Royal Arms, Royal Regiment of Artillery, Tercentenary scroll, The Queen on 6 June 2016 by Patricia.